There has been a failure to attract a fifth of the trainee teachers the government says are needed for secondary schools in England. Department for Education figures show only 80% of trainees were recruited on to schemes in 2017 and targets were hit in only two of 15 subjects. It is the fifth year in a row teacher training targets have been missed. However, School Standards Minister Nick Gibb said there were a record number of teachers in schools. "We simply cannot go on like this," said the Association of School and College Leaders' head Geoff Barton. "There are severe teacher shortages in many subjects and in many areas of the country, and this is having a real and detrimental impact on the quality of education that we able to provide to our young people. "It is imperative that we better incentivise teaching as a career, not least through a cost-of-living pay increase which addresses the significant real-terms decline in teaching salaries and which is fully funded by the government." Every year, around 30,000 new teachers need to be recruited in order to ensure schools have enough to staff their classrooms. There were 27,895 new entrants to postgraduate Initial Teacher Training courses in the academic year 2017 to 2018, compared with 26,750 in academic year 2016 to 2017. Mr Gibb said there were 15,500 more teachers in schools than in 2010. "The fact that more than 32,000 new trainee teachers have been recruited in a competitive labour market, with historic low unemployment rates and a growing economy, shows that the profession continues to be an attractive career," he said. "These numbers build on last year's figures, with 1,100 more graduates training to teach and the number of them holding a first-class degree now at record levels, meaning we're attracting more of the best and brightest into our classrooms. "Of course, we want these figures to continue to increase, which is why we recently announced generous bursaries and other financial incentives to encourage even more talented trainees to key subjects, such as maths and physics." 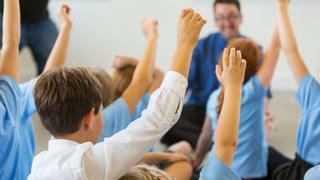 There has been growing pressure for a pay rise among teachers and other public sector workers. The government has suggested it is prepared to lift the public sector pay cap on wage rises of 1% a year. But there was no confirmation of that in the latest Budget. How can schools recruit, and keep, more teachers?